Each week, NBC Chicago teams up with local chefs for a lesson in cooking. 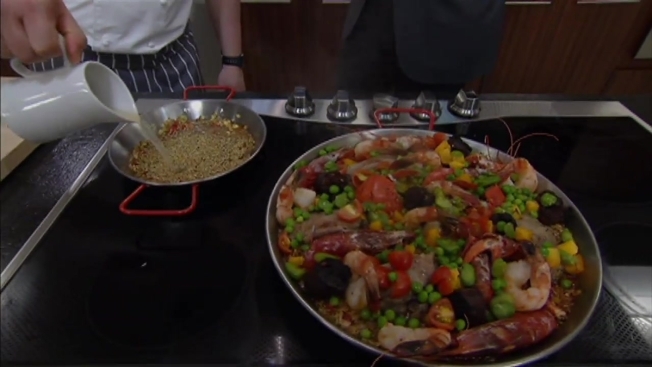 This week, Chef Tim Graham from Travelle shows us how to make his Green Farro Paella recipe. Graham is set to participate in a paella cook-off at Mercat a la Planxa in June as part of Chicago Gourmet. 1. Heat oil in paella pan. Add shrimp and blood sausage and cook for five minutes until brown. 2. Remove shrimp from pan. 3. Add duck confit to pan and heat through. 4. Add paprika, garlic, bay leaf, rosemary and tomatoes and leeks to the pan. Turn heat down. 5. Sweat until the onions are soft. 6. Add chicken stock, season and bring to boil. 7. Add the farro evenly to the pan. Add peas, fava and pequillo pepper. 8. Cook without stirring for 10-12 minutes. 9. Add shrimp and lobster (cut side down) to the pan and cook until lobster is cooked and all liquid is absorbed. 10. Remove from heat, cover with foil and let rest 5 minutes.